Over a period of several decades, Cambodia experienced prolonged civil conflict that cast a paralyzing shadow over its entire society, most notably during the rule of the Pol Pot-led Khmer Rouge from 1975 to early 1979. That brutal regime is estimated to have killed approximately 1.7 million Cambodian people through various systematic means including torture, execution, enslavement, starvation and forced labor, under its Maoist-oriented ideology – the so-called Super Great Leap Forward policy – combined with a heavy dose of paranoia. January 7, 1979 was for Cambodia a milestone. That was the day the Vietnam-backed Kampuchean United Front for National Salvation (KUFNS), under Heng Samrin, the current president of National Assembly, captured the capital Phnom Penh, finally ousting the Khmer Rouge several days later. However, for another 19 years, Khmer Rouge soldiers waged guerilla warfare along the northern borders with Thailand, a conflict that only ended with the death of Pol Pot (in 1998) and other cadres and the Win-Win Policy of the Hun Sen government. One year before peace was finally restored to the kingdom, the Cambodian government had lodged a proposal for a postwar transitional justice court with the Secretary-General of the United Nations (UN), in which it sought assistance in setting up trial proceedings against the “most responsible” Khmer Rouge leaders. Eventually, in 2006, the so-called hybrid Extraordinary Chambers in the Courts of Cambodia (ECCC) began work with financial aid from more than 35 countries (with Japan to date accounting for almost 50 percent of all contributions to the court) to prosecute Khmer Rouge senior leaders and those “most responsible” for genocide, crimes against humanity, and other serious abuses committed during the Khmer Rouge-reigned period. Since the court began its work in 2006, with high expectations that it would give victims justice in postwar Cambodia, more than 30,000 people, including survivors, have visited the court to witness trial proceedings. Millions more have followed on television or online. In 2012, the court finally ended the very time-consuming case 001, sentencing prison chief Kaing Guek Eav, known as Duch, to life imprisonment for his “shocking and heinous” crimes. 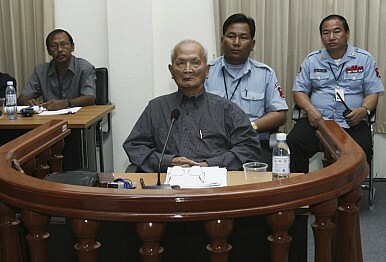 As of early 2011, four senior Khmer Rouge leaders – Noun Chea, the deputy secretary known as “brother number two”; Khieu Samphan, head of state of Democratic Kampuchea; Ieng Sary, deputy prime minister and minister of foreign affairs; Ieng Thirith, minister of social affairs – had been indicted. They were thus the defendants in case 002, in which they would answer for their actions during the alleged genocide. But over the last eight years, the ECCC has been widely criticized for the languid pace of its proceedings. It has also faced many challenges, making it uncertain whether or not full transitional justice will be possible, not only for those who were killed, but also for those who lived, traumatized and bereft. Even prior to case 002, the court was dealing with government displeasure over subsequent cases. For instance, cases 003 and 004 have been deemed sensitive, involving former Khmer Rouge cadres who currently hold high-ranking positions in the government. The court has also been criticized for incompetence, ineffectiveness, corruption, lengthy trial proceedings, and complicated political issues. The ECCC has consequently been widely regarded as inadequate and unable to deliver the justice that would satisfy either its donors or the victims. Since early 1999, neither Cambodia’s local civil society organizations (CSOs) nor its citizens have had much say in the functioning of the tribunal. Therefore, despite the ongoing proceedings, the CSOs and Cambodian people, especially the victims, have been regarded as followers of the trials, rather than as active participants. In short, the court’s agenda has been dominated by the government and the ECCC. Another hurdle for justice is the practical inability for the court to prosecute any individuals who are currently part of the government. Hun Sen clearly prioritizes national security, social harmony, political stability, and steady economic growth, even if that is at the expense of justice. And the Cambodian judiciary is hardly independent, ultimately answering to the Supreme Council of Magistry, a constitutional body with the power to take disciplinary actions against judges and prosecutors. Appetite within the ruling Cambodian People’s Party (CPP) for prosecutions is weak. Prime Minister Hun Sen – a former Khmer Rouge commander who defected in 1977 – together with other senior government officials are opposed to further trials, repeatedly warning that additional prosecutions would upset reconciliation with former Khmer Rouge guerillas, and spark another civil war, although many independent Cambodian political analysts see that as unlikely. Information Minister Khieu Kanharith concurred: “If they [international staff] want to go into case 003 and 004, they should just pack their bags and leave [Cambodia].” And so only five former senior Khmer Rouge leaders have to date appeared before the tribunals, while the low and mid-level perpetrators and other top government leaders, including former Khmer Rouge military and political cadres who would certainly seem to fit the description of “most responsible” for the atrocities, are now in power and apparently safe from prosecution. Meanwhile, the Cambodian government has been unwilling to cooperate with the ECCC in building a permanent center to store its archives, as a resource for students, scholars, and other researchers studying war crimes and other Khmer Rouge atrocities. The Japanese government offered $2 million to build the center, with the Cambodian side to fund its operations. More than four years later, however, although the center has long been built, it still stands empty on a patch of land in Sen Sok district. CPP spokesman, Phay Siphan, said he was “unaware” of any legacy project, while Neth Pheaktra, a spokesman for the court, said there was “no money available [from Cambodian side] to embark on the sustained legacy project,” although the government has had no trouble funding dozens of ceremonies, including the recent Angkor Sangkran celebration taking place on Khmer’s traditional New Year in Siem Reap province recently. The court has faced other troubles. In a 2007 and 2008 kickback scandal, “Cambodian staff complained that they were being forced to bribe their superiors to keep their [lucrative] jobs.” Former UN human rights envoy to Cambodia, Yash Gai, wrote in 2009 that “the weakness and corruption within the national legal system have infected the ECCC, instead of the ECCC influencing the conduct of local judges and prosecutors.” Similarly, according to Kelli Muddell, a rapporteur from International Center for Transitional Justice (ICTJ), the Cambodian people have lost faith in the public institutions and have little trust that perpetrators would be held accountable before the ECCC, given the corruption in the legal system. The lengthy proceedings have been costly, with spending estimated at more than $200 million. Much of the funding for the court has come from international donors, who have been told that “their money was purchasing not only a semblance of justice [for Cambodians], but also lasting improvements in the Cambodian judiciary.” Given the advance ages and health problems of the defendants in case 002, it is questionable whether justice can truly be delivered. Any change will require from all parties – the Cambodian government, the ECCC itself, CSOs, and the Cambodian people – a genuine willingness and commitment, with strict regulations to tackle corruption scandals along with effective and rapid reform. For now, though, a lack of stakeholder participation, a patronage-driven court structure, systematic corruption, financial question, time-consuming trial proceedings, and particularly a dubious commitment from the government look likely to deny Khmer Rouge victims their justice. Lak Chansok is a lecturer at Institute of Foreign Languages’s Department of International Studies, Royal University of Phnom Penh (RUPP), and has been a research fellow at Cambodian Institute for Cooperation and Peace.